Each season we organise practical workshops, artist’s pop-up events, ways to explore making stuff inventively, ethically, environmentally. You can join in with many of these and we are very happy to consider new projects, so please get in touch to discuss any ideas you might have. Sign up to our email list to be the first to know about practical workshops at GroundWork. 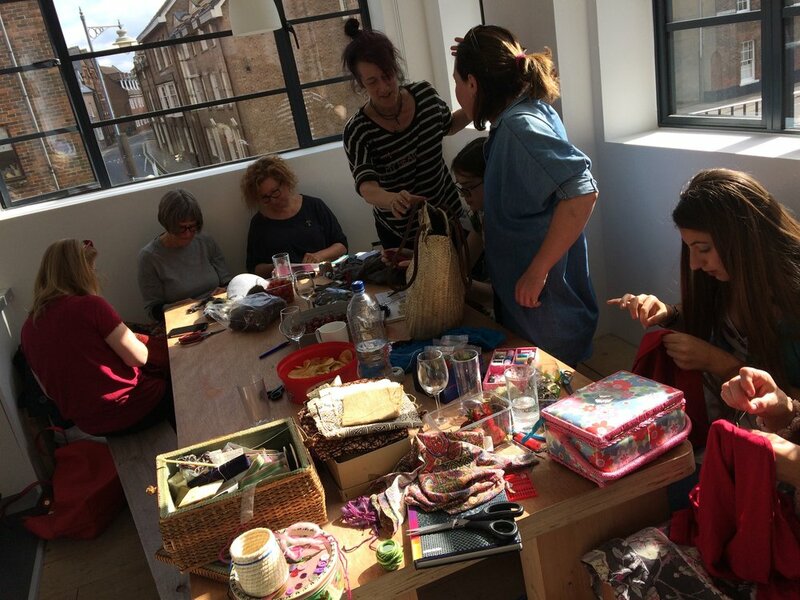 Starting on 23rd March 2019, our aim is to hold an informal drop-in workshop for sewers, knitters, crocheters, menders,normally on the 3rd Saturday each month from 2-4. A visit to Norwich Castle resulted in a discussion about metre cube test pits with an archaeologist who was studying the finds around Caistor Roman camp. I decided to apply these methods of investigation to my garden. Instead of just exploring/recording/cataloguing what was above ground I would investigate below ground as well. I had no expectations of what I would find but was fascinated by the idea of taking out a metre cube from below (seemingly so solid and dense) and putting it above ground in the airy spacious atmosphere. I liked the apparent pointlessness of it and chose to treat it like a formal archaeological investigation: sieving all the soil, recording what I found at each level, taking flotations and cataloguing the structure of the ground beneath my feet. The interim arrangement of finds, by material type. The Cloth of Kindness is a community led health and well-being textile arts project bringing together people of all ages and abilities to embroider their thoughts and experiences of kindness on individual patches which are then sewn together to make a Cloth of Kindness. The first Cloth of Kindness was made by artist Sally-Anne Lomas for exhibition at the Burning Bush Gallery in Norfolk and was inspired by the writings of Julian of Norwich, C14th mystic famous for the phrase ‘All shall be well and all shall be well’ and the beautiful embroidered letters of Lorina Bulmer, resident in the Great Yarmouth Workhouse in the late C19th. 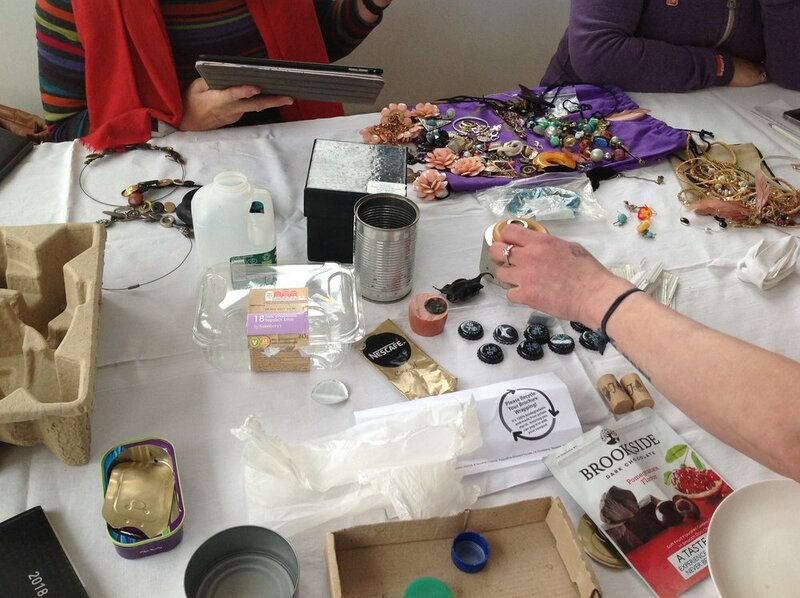 This began as an inspiring Visible Mending workshop with Kate Sekules in summer 2018. We enjoyed it so much, we carried on meeting on Saturdays and discovered that several members of the group have tremendous skills and experience in design, in all kinds of sewing techniques and pattern-cutting. So we are gradually going to bring more of those skills into play. From our last discussions on Saturday, we began to talk about organising some bigger skill-sharing workshops which can lead to a chance to exhibit some pieces in the autumn exhibition in GroundWork Upstairs. Dates will be announced. Contact us here if you want to be kept up to date, or drop in on one of the regular Saturdays. 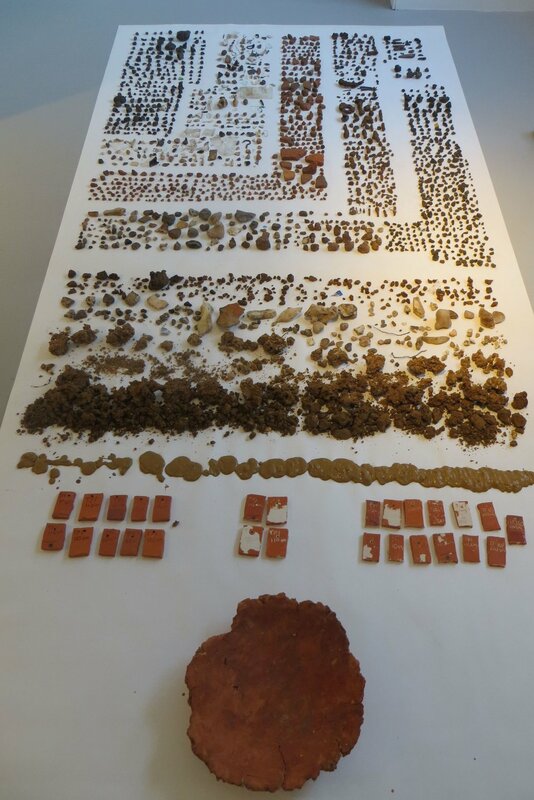 Artist Sarah Caputo spent the week of 21st January on project GRTF994135, laying out finds from a metre cube test pit from her garden. The project began as an experiment, using the gallery while it was closed, just to see what the finds would look like. It turned out to be beautiful and fascinating. So much interest and variety from earth, stones, the ordinary rubbish of ages. In the first few centimetres, amongst the scattered objects and materials that I recognised as my own, there was evidence of the mundane rubbish of others- a sense of banal everyday history was intense. Ordinary people going about ordinary lives. Further down it felt primeval to create an earth lined, cool, damp geometric space where I could sit and stare at the changing layers of colour, follow roots and discover deposits of stone, loam and conglomerate not disturbed since they were laid down thousands of years before. In the water drenched base I found clay to fire - here was the very stuff I had been using in my studio for so long- a completed circle. Sally Ann Lomas explaining the Cloth of Kindness project to a participant. We are currently making a Cloth of Kindness for the Kings Lynn Big C Centre which will be used by cancer patients having relaxation therapy during their treatment. Our aim is to ‘enfold the world in love’ by wrapping up people having a tough time in soft warm textures sewn with words of hope and encouragement. At Groundwork gallery we will be using recycled materials so please bring along any pieces of warm coloured plain material that are washable for us to use. We particularly love including materials that have a special emotional resonance – maybe from a piece of clothing that conjures up memories of happy times, special occasions, or much loved people. A few examples of new patches made at the workshop. The sewing skills needed to participate are basic and easily learnt. Sewing workshops bring people into a supportive community. Sewing is a low energy, creative activity open to everyone and the focus on kindness is uplifting. At the Groundwork gallery we will be using recycled materials so please bring along any pieces of warm coloured plain material that are washable for us to use. We particularly love including materials that have a special emotional resonance – maybe from a piece of clothing that conjures up memories of happy times, special occasions, or much loved people.